John Hastings crashed some quickfire runs in the afternoon session of day three to all but end Sussex’s hopes of victory in their County Championship tussle with Durham at Arundel. Hastings hit an incredible 91 from just 72 balls including nine fours and five sixes to put his side well in the ascendancy. He and Chris Rushworth (19) added some quick runs and put on 48 for the ninth wicket in the early part of the afternoon. Hastings did eventually fall nine runs short of his century when he was clean bowled by Tim Linley. That innings seems to have taken the game well away from Sussex and when Hastings did fall Durham were all out for 413, meaning they have set a target of 514 for the home side to secure an unlikely victory. Steve Magoffin finished with figures of 5-89, while Linley took three to add to his five in the first innings. 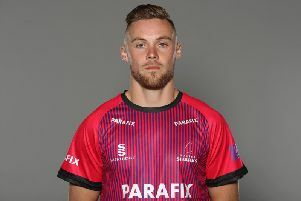 They did see out the final 11 overs before tea without losing a wicket as Mike Yardy (24*) and Luke Wells (23*) helped their side to 51-0, which is just the second 50-plus opening partnership this season. That means the Sharks still need a further 463 runs for the most unlikely of successes. If Sussex do manage to chase this score down it will be a new club record and will see them surpass the 455 they chased down in the fourth innings against Gloucestershire in 2000.